Here is an image we discovered at the Western Reserve Historical Society a couple years ago. Many of you will recognize right away the oft-photographed Excelsior Mill, built by John L Marye (whose house, Brompton, sits on the distant heights just out of the view to the right). But this image taken from the Stafford shore, just above the ruined Railroad Bridge, shows several things we had never seen before. Take a closer look. First, look at the ladies who have strolled out onto the bridge. This is the only known photograph that shows Fredericksburg civilians during the war. They clearly are aware of the Yankee cameraman on the other side of the river. In fact, it’s hard to believe some yelling back and forth didn’t go on to pose the image to the photographer’s satisfaction. 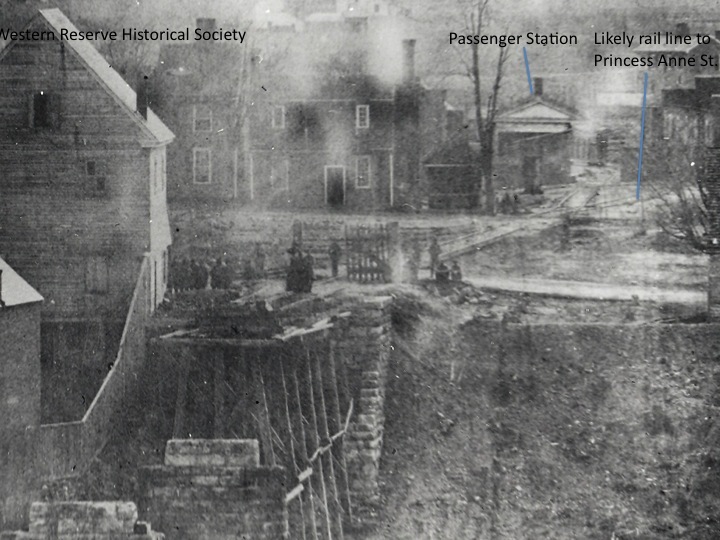 More importantly, this image shows the Richmond, Fredericksburg, and Potomac Railroad passing through town at-grade–something it hasn’t done for nearly 90 years (this part of town is today completely transformed by the elevated tracks, large train station, and parking lots to serve it; today, not a single building visible in this view survives). None of this is vitally important in its own right, but each is a little piece of the puzzle that is the battlefield landscape of 1862. Upcoming: Eric Mink is nearly done with his analysis of the slave cabins at Chatham. It should go up on Friday. Noel Harrison is also going to share his perspectives on a rarely seen image of the upper pontoon crossing in 1863. Fredericksburg–the most complex field in America? While the battle itself is often (though perhaps wrongly) viewed as being straightforward and simple, Fredericksburg’s is likely the most complex battlefield landscape in America. Integral parts of the battlefield landscape include: the site of a river crossing made under fire, using both boats and bridges; a core urban area devastated by the massive Union bombardment intended to quell resistance to the bridge-builders at two sites; the scene of intense street combat, some of it from house-to-house (many of the houses remain); a town that became a staging area for massive Union attacks and the scene of American soldiers looting an American city; industrial facilities (most notably, the canal ditch) that materially affected troop movements and tactics and added significantly to the human ordeal of battle; farms and plantations–with distinctive patterns of forest and fields–that were the scene of intense fighting; road networks; and smaller residential communities (like that along Hanover Street and near the Fairgrounds west of town) that were consumed by battle. Much of the park’s research (constant over the years) and investigation (usually archeological) is focused on understanding this varied landscape and how the events of December 11-15, 1862 affected and (more importantly) were affected by it. The process is like putting together a huge puzzle with many missing pieces. Every once in a while, a new piece of the puzzle comes to hand. That’s the sort of thing we plan to share on this blog. What do we do with it all? Fortunately, the park has tremendous institutional memory in the form of Noel Harrison, Eric Mink, Frank O’Reilly, Donald Pfanz, and Greg Mertz (of those, I, Hennessy, am the short-timer, and I have been here for 15 years). 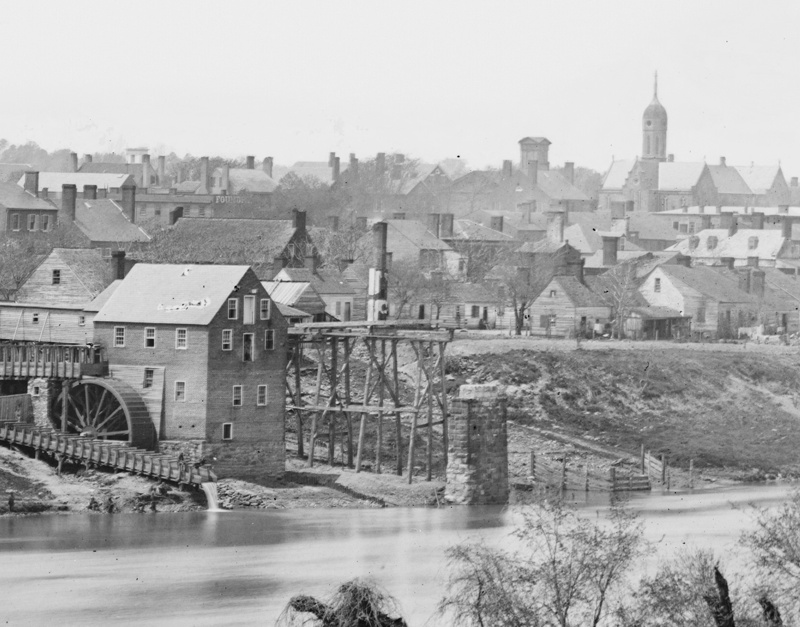 But we are also undertaking a major project that will capture all the work that’s been done over the years–all the pieces of the puzzle–in the form of “Virtual Fredericksburg”–a digital, interactive, 3-D, navigable map of the Fredericksburg Battlefield that we plan on rolling out this summer. Into this map (or rather the database that underlies it) we will deposit most of what we know about specific sites on the battlefield and in town–every photograph, every primary source, digital media like short films and podcasts. We are working on a similar project for the Wilderness. This project is a prototype not just for battlefields, but for all National Parks. Our goal is to have these be the virtual, one-stop gateways to these sites. We will keep you posted on our progress on this project–one that I must say intrigues me in its possibilities more than anything else I have worked on in my NPS career. Another little tidbit from the panoramic image we unrolled the other day. This blowup shows two things of interest. Most notable is the African Baptist Church, now the site of Shiloh Baptist Church (Old Site) on Sophia Street. Prior to 1855, this building housed the Fredericksburg Baptist Church, including both white and African-American members (the latter considerably more numerous, by the way). But in 1855, white congregants built the present church on Princess Anne Street and sold the building in this view to the church’s black congregants. Rev. 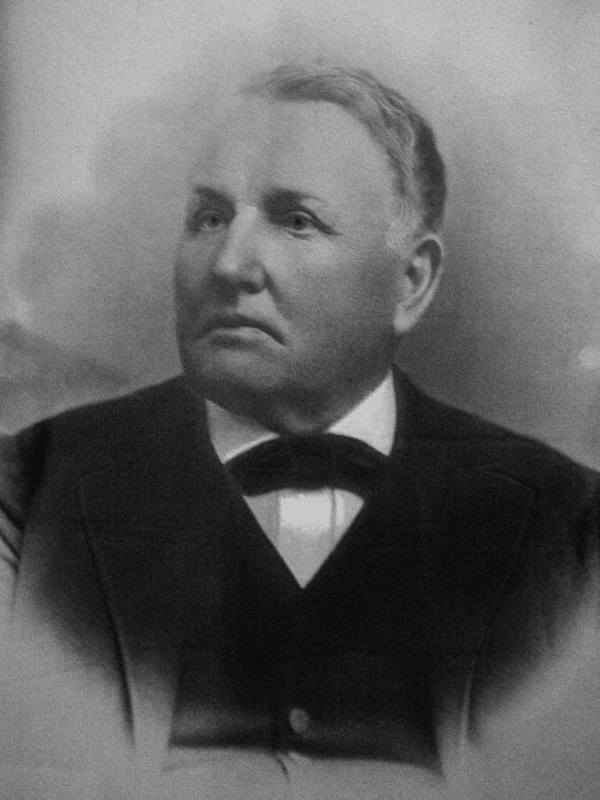 George Rowe, a white man and father of Absalom Rowe (see post of yesterday), was the pastor of the church (law required that a white man be present for gatherings of African-Americans). After emancipation, the church became Shiloh Baptist Church. The building in this view survived until the 1880s. The congregation still thrives. This, by the way, was the slave John Washington’s church; he writes vividly of this in his memoir. Also of interest in this image is the roofed structure on the camera side of the church. This was the community ice house–owned in 1860 by a man named John Ferneyhough. Most years, ice was shipped to Fredericksburg from up north, but occasionally the Rappahannock produced enough to stock the place. 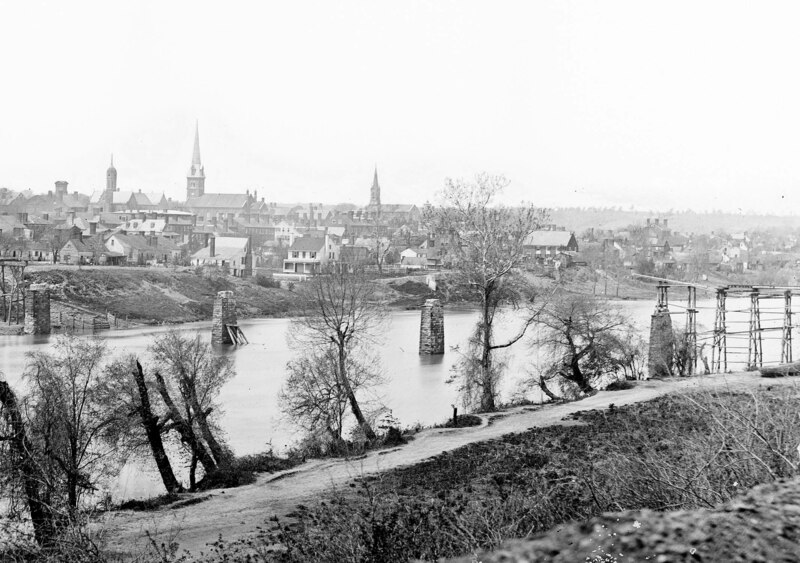 In 1857, workers cut ice 17 inches thick off the Rappahannock. Many homes had their own ice houses (the ice house for the Sentry Box on Caroline Street was recently the subject of an extensive archeological investigation), and indeed we will do a post soon on the ice house at Federal Hill on Hanover Street, which would become notoriously famous. But the one in this view served the needs of downtown for many years, and is an example of the sort of utilitarian structure once common on American towns that is now obsolete. 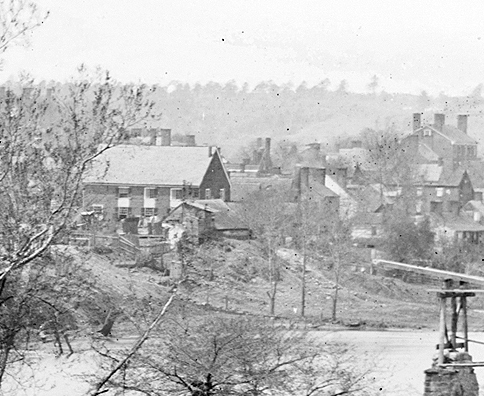 Here is another segment of the great waterfront panorama of Fredericksburg (see below), recorded in the spring of 1863. This blowup focuses on the home and yard of Absolom P. Rowe, a cattleman and future mayor of Fredericksburg. Several interesting things here. The house, which no longer stands, is on the left, its front perpendicular to Sophia Street (or as it was more commonly referred to then, Water Street). Between the house and the river is a line of earthworks constructed by the Confederates during the winter of 1862-1863. This line, in fact, runs virtually the entire length of the larger panorama. But most amusing is what appears to be Mr. Rowe’s outhouse, perched on the slope leading down to the river–separated from the main house by the Confederate works (something that would likely to have been a major inconvenience during any nighttime forays). A couple of larger points. First, Sophia Street was then, as it is today, a jumble of things, many of them short-lived, some of them unsightly, some beautiful. The rhythmic floods that inundate that part of the city rendered permanence there rare. Indeed, the city has, at least for the moment, surrendered to the forces of nature and is now creating a park along much of the riverside on Sophia Street. The character of Sophia Street is changing dramatically. A.P. Rowe, the owner of the house in the image, was the son of George Rowe, (the elder Rowe was a prominent cattleman and, later in life, ordained pastor of the African Baptist Church–more on that church in a later post). The younger Rowe entered the cattle business, and during the war was a buyer for the Confederate Commissary Department. 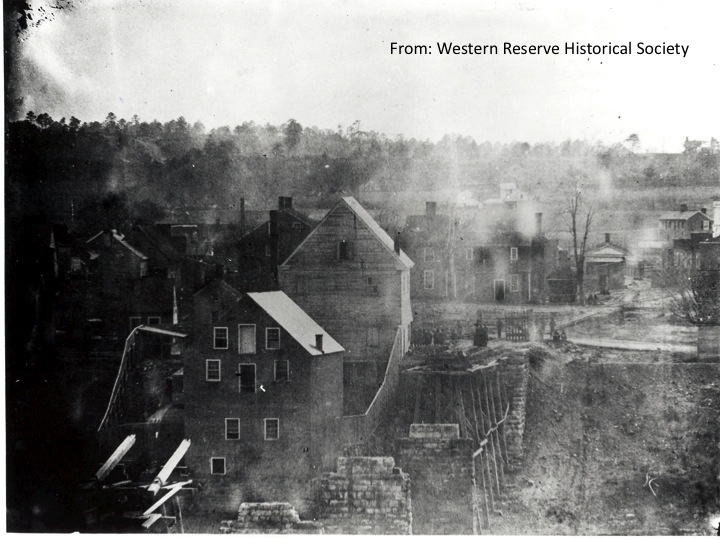 Rowe owned a slaughterhouse whose waterside fencing is also plainly visible in the panorama just above the ruins of the railroad bridge. Not too the soldiers fishing in the river just below the outlet of the flume to Marye’s Excelsior Mill (which, by the way, was brand new at the outset of the war). From Hennessy: Most of what we find in historic images is easily identified. But occasionally they produce something that’s a bit of a mystery. Case in point. The steeple of the Baptist Church on Princess Anne Street is obvious enough, but look just to the right of the church, just above the branch of the tree. That cupola, prominent, appears to fairly dominate the north end of town. 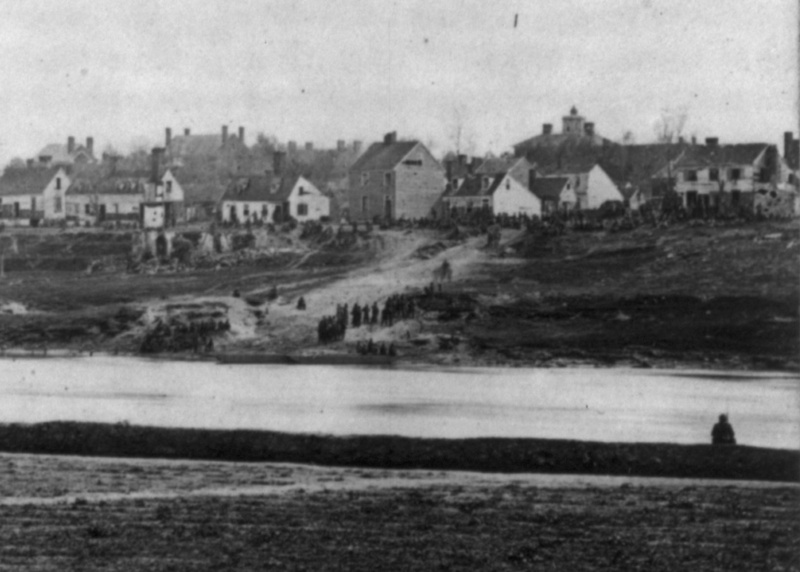 The same feature appears more prominently in this image of the upper pontoon crossing in 1863 (after Chancellorsville). You’d think something as obvious as that building would be well-known. In fact, there are no known references to what it is. But, plotting the angle of the image on our 1860 map of Fredericksburg, we can come up with a likely location: just north of the Mary Washington House on Charles Street, at the corner of Fauquier and Charles. Today this is a large, gray duplex, its date unknown (at least to me, so far). In 1860, it was the residence of two families. But one wonders if at some point it hadn’t been a school. This section of town was spattered with schools, including Jane Beale’s, only 100 yards away. In any event, the identity of this cupola remains something of a mystery, and thus a curiosity. Two things stand out here. 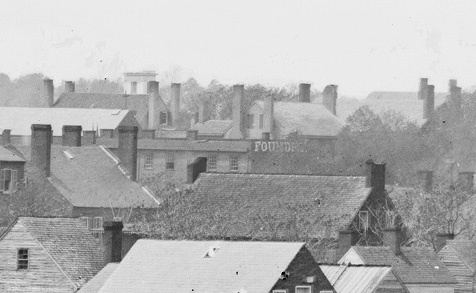 One is the large painted sign on the upper facde of the Hope Foundry, which stood where the Fredericksburg Police Department now stands on Princess Anne Street. Hope Foundry was one of the larger industrial operations in town, and a noisy one too. Betty Herndon Maury, who for much of 1862 lived across the street at what is today called Haydon Hall, occasionally mentioned the noise of the Foundry in her wonderful diary. And to the left of that is the building with the white roof. If you look closely at its gable, you can see a cross perched atop it. This is old St. Mary’s Catholic Church–just five years old when this view was taken. And just above the cross on St. Mary’s is the cupola of the Methodist Church North–still the site of the Fredericksburg United Methodist Church (though today’s building dates to the 1880s). I’ll be posting more tidbits from this and other images…. There is a persistent and oft-repeated local belief that the famous photograph below is NOT in fact of buildings at the junction of Hanover and George Streets. I have had probably a dozen people argue that the photo is someplace else. To put that to rest, I offer up a couple of images that prove, I think conclusively, that the image is indeed of houses at the junction of Hanover and George Streets–Sandy Bottom, as it was known. 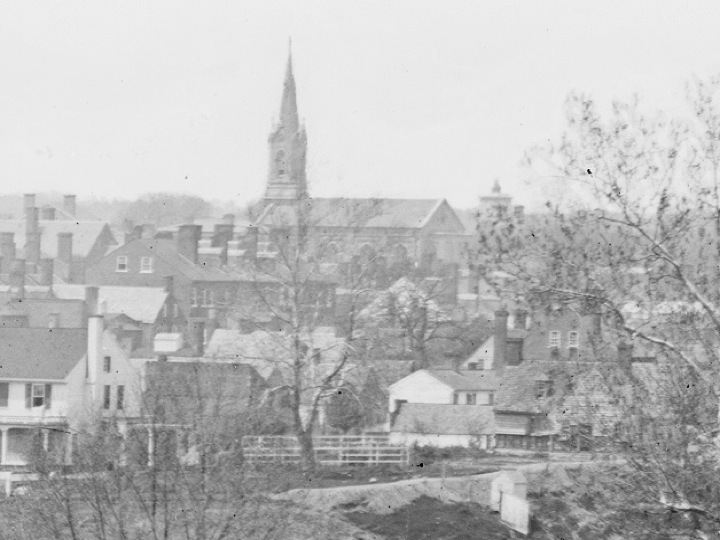 Most importantly, the steeple on the right edge of the image is without question the steeple of St. George’s Episcopal Church, which still stands at the corner of George and Princess Anne Street. 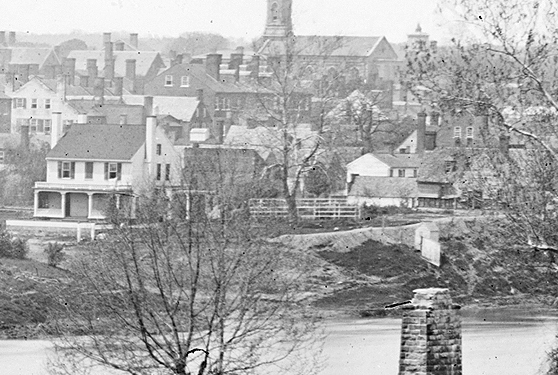 More proof comes from an equally famous photograph taken about 200 yards to the right of this image–the famous panorama of the Fields in front of Marye’s Heights that we have used as our banner image, above. I post below a detail from that image. 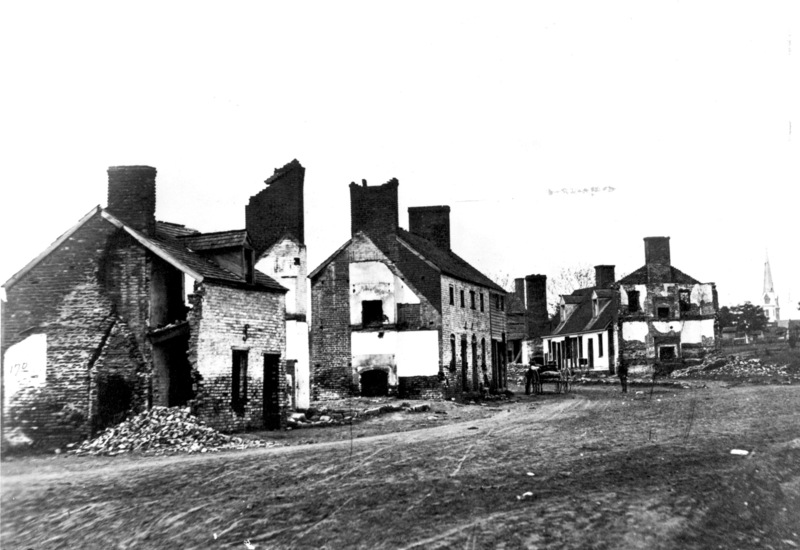 This image was taken from in front of Federal Hill on Hanover Street, looking westward across what we have come to call the “Bloody Plain” in front of Marye’s Heights. Look closely at the building on the left of the row of buildings at the junction of Hanover and George. It matches precisely the nearest building in the banner photograph: the corner is gone, the pattern of windows is the same, etc. While the pile of bricks in the close-in view is gone in the Federal Hill view, there can be little doubt that we are looking at the same set of buildings in both images. By the way, at least two of the buildings in Hanover/George image were owned by Peter Goolrick, the man who in 1860 owned more property in Fredericksburg than anyone else. An Irish immigrant who arrived in Fredericksburg at age 17 and built a fortune, his house still stands at 723 Caroline Street–at the corner of Hanover and Caroline. Today the building houses, ironically, Irish Eyes, a specialty shop. Every week the park staff has conversations (sometmies rigorous) about a new photograph, a new source, or a new idea about the historic landscape on and around the four battlefields within the park. A few of these discussions lead to new understandings or insights. We will, by virtue of this blog, take some of those conversations and explorations public. Our purpose is, in part, to share with the public some of the work that makes our jobs so very interesting. At the same time, we know there are many people out there with lots of knowledge, sources, and additional information that will add to a better understanding of the landscape and resources we manage and interpret. This blog is an open invitation for you to join in and add to an exploratory process that, we hope, will enhance preservation of the battlefields in and around Fredericksburg. Much of the material posted here will be provided by the park’s cultural resource managers, Eric Mink and Noel Harrison, though other members of the staff (Greg Mertz, Frank O’Reilly, Donald Pfanz, and John Hennessy) will also chime in occasionally. Comments are welcome.